Drummer Leo Morris was born in New Orleans, Louisiana on November 3, 1939. Music apparently was in the blood of the Morris family boys, because Leo and his brothers all became drummers. In an interview with R.J. DeLuke on the allaboutjazz.com web site (link at the bottom of this article), he says he had his first professional gig with the Neville Brothers when he was 14 or 15. At some point in the 1960’s, Leo Morris became Idris Muhammad. Muhammad is one of the most respected drummers in the business. Over the years he has played with Lou Donaldson, Johnny Griffin, Joe Lovano, Ahmad Jamal, Roberta Flack, Curtis Mayfield, Etta Jones, Horace Silver, Betty Carter, Roland Kirk and many others. He appeared as a sideman on numerous albums for other people, but barely a dozen recordings carry Muhammad’s name as the leader. The album I’m going to talk about tonight is the funk-soul-jazz classic, “Power Of Soul”. 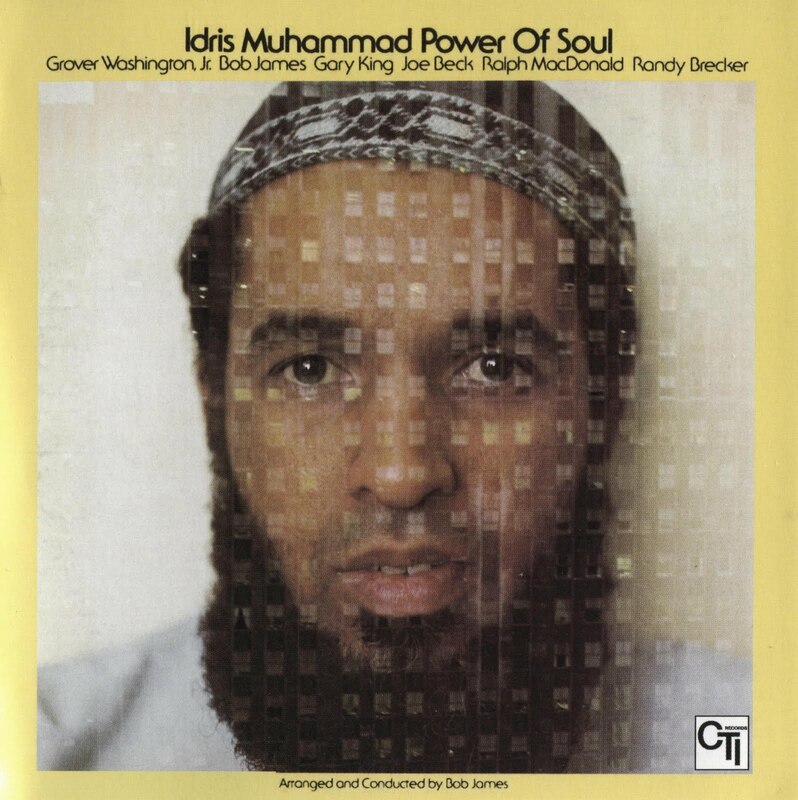 “Power Of Soul” was recorded at Rudy Van Gelder’s New Jersey studio on March 1 and 14, 1974. It was released later that year on Creed Taylor’s label, CTI. When this album was originally released on vinyl, it contained only four tracks and ran only 34 minutes. Unfortunately for jazz lovers everywhere, when Epic/Legacy chose to re-release “The Power Of Soul” on CD in 2002, they did not bother to add any extra tracks. We are the poorer for this lack of foresight. Track one is the title track, a Jimmy Hendrix composition that starts slow with King running a fast bass line, then quickly builds in intensity as first the horns and then everyone else jumps in. When I first heard “Power Of Soul”, I didn’t particularly care for it. It was, in fact, probably my least-favorite song on the album. Time has passed and I suppose you could say it has grown on me. Fans of straight-ahead jazz and only straight-ahead jazz probably aren’t going to like this song, or, indeed, this album. Those with a mind open to the qualities of other musical styles and genres may find themselves falling in love. Beck’s guitar toward the end is a wild ride. He may be no Jimmy Hendrix, but he’s an excellent guitarist who is more than a match for the material. “Piece Of Mind”, written by Bob James, is the second track. It, too, begins in a mellow manner and builds, albeit in a more restrained manner than the opener did. Brecker really shines here, and if I didn’t know better I’d say there were three or four violins on part of this. Washington’s soprano sax steps up a third of the way along. This recording was made fairly early in Washington’s career, although he had released five or six albums under his own name by this time. “Piece Of Mind” manages to be quietly pleasing without slipping into the realm of what I refer to as “book-reading music”. Joe Beck’s “The Saddest Thing” is the third track. It does begin sounding a bit mournful, but eventually picks up a little. While far from being a dirge, “Saddest Thing” isn’t exactly a song to clap your hands and stomp your feet along with. About halfway through Washington picks up the pace a bit with his soprano sax, and Brecker continues that line on trumpet. “Power Of Soul” closes with the longest song on the disk, “Loran’s Dance”, which was written by Grover Washington, Jr. This song, like all the others on this album, begins quietly, with King noodling on the bass and Muhammad quietly doing his thing. First the horns come in, followed by Beck on the guitar with I think his mellowest contribution on the album. About halfway through the song, Washington takes the lead with his sax and gives us some of his best blowing on the album. Toward the end, James and Beck trade licks with Washington. In sharp contrast to most of the previous albums I’ve talked about here, “Power Of Soul” is probably better suited to later in the evening, when things are winding down. Regardless of when you chose to listen to it, I think you’ll find that “Power Of Soul” will make a wonderful addition to your personal playlist for a Saturday, or any other night! To learn more about Idris Muhammad and his music, check out the complete interview R.J. DeLurke did with him on allaboutjazz.com: http://www.allaboutjazz.com/iviews/imuhammad.htm. Additionally, Idris Muhammad’s music is available online through the usual sources.